Reel Talk Online: First Look: "Our Family Wedding"
First Look: "Our Family Wedding"
Those of you who follow me on Twitter may already know how much I am a fan of Southland star Regina King, so I am thrilled to learn she is returning to the big screen in this upcoming romantic comedy Our Family Wedding. I'm not a huge fan of rom coms, but this one doesn't look half bad. 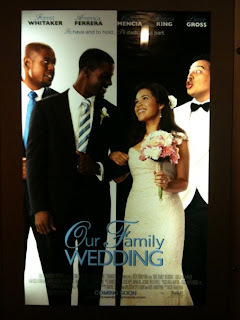 Co-starring Forest Whitaker, America Ferrera, Lance Gross and Taye Diggs, the movie surrounds a couple whose interracial relationship (he's African-American and she's Latina) and impending parenthood send their family into a tailspin planning nuptials that cater to both heritages. This isn't anything we haven't seen before, but it may just be some good old-fashioned fun at the movie theaters (here's hoping!). Take a look at the trailer below. Our Family Wedding hits theaters March 19. I'd like to see this too!